. 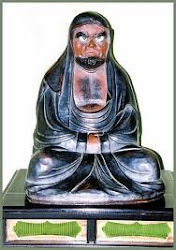 otogibanashi kubi ningyoo お伽話首人形 head dolls from fairy tale heros .
. Benkei, Musashibo Benkei 武蔵坊弁慶 .
. Hanasaka Jiisan 花咲かじいさん Grandpa making trees blossom .
. Issun Booshi 一寸法師 Issun Boshi "Tom Thumb" .
. Momotaroo 桃太郎 Momotaro, The Peach Boy .
. Urashima Taro 浦島太郎 Urashima Tarō .
. Tanuki Oshoo たぬき和尚 Tanuki and Priest . The hare woke with a start from a fitful sleep and gazed round, looking for the tortoise. But the creature was only a short distance away, having barely covered a third of the course. Breathing a sigh of relief, the hare decided he might as well have breakfast too, and off he went to munch some cabbages he had noticed in a nearby field. But the heavy meal and the hot sun made his eyelids droop. With a careless glance at the tortoise, now halfway along the course, he decided to have another snooze before flashing past the winning post. And smiling at the thought of the look on the tortoise’s face when it saw the hare speed by, he fell fast asleep and was soon snoring happily. The sun started to sink, below the horizon, and the tortoise, who had been plodding towards the winning post since morning, was scarcely a yard from the finish. At that very point, the hare woke with a jolt. He could see the tortoise a speck in the distance and away he dashed. He leapt and bounded at a great rate, his tongue lolling, and gasping for breath. Just a little more and he’d be first at the finish. But the hare’s last leap was just too late, for the tortoise had beaten him to the winning post. Poor hare! Tired and in disgrace, he slumped down beside the tortoise who was silently smiling at him.
. Bunbuku - A tanuki badger turned tea kettle . 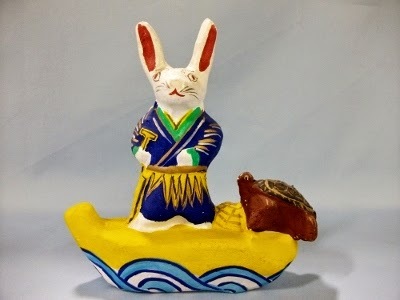 kachikachi yama かちかち山 "The Farmer, the Badger and the Rabbit"
. 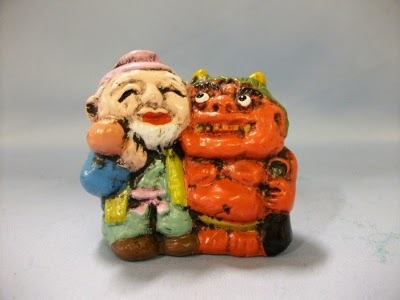 Kachi-Kachi Yama かちかち山 The Crackling Mountain Story . In addition, they take the lump off his face, thinking that he will want it back and therefore have to join them the next night. An unpleasant neighbor, who also has a lump, hears of the old man's good fortune and attempts to repeat it, and steal the gift. 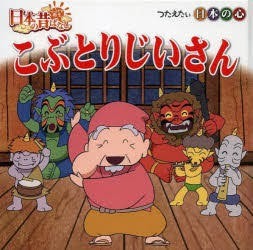 The tengu, however, simply give him the first lump in addition to his own, because they are disgusted by his bad dancing, and because he tried to steal the gift.
. kaguyahime かぐや姫 Kaguya Hime, the Shining Princess .
. sarukani, saru kani gassen さるかに合戦 "Monkey Crab Battle" .